Tom Hiddleston Talks “Avengers.” | The Cineaste's Lament. English actor Tom Hiddleston, who plays the villainous Loki in Joss Whedon’s upcoming “The Avengers” sat down to talk with Brit film site HeyUGuys about his turn in the superteam flick. 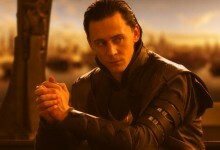 “Q: Loki May be a villain, but he’s a rather likable one. How on earth did you achieve that? A:I started building the character with Kenneth Branagh in Thor. We approach all characterisation in the same way, you have to start from a place of compassion. It doesn’t matter how evil and misguided and deluded the choices of a character are, in their own mind, they’re the hero of their own story, and that is true of everyone in this room. We are the lead protagonists in the movie versions of our lives. Part of what excites me about the job of acting is that it’s an exploration of human nature. There’s a psychological element to it. The part I love is that you’re extending your understanding of human beings, and examining truths that don’t belong to you, and if you look at the villains of human history, quite often they’re motivated by emotional damage. That was the interesting place to start with Loki, he was somebody who was brought up as a prince in the royal family with the expectation that one day he would be a king. Throughout the course of that film he learns that the entire narrative of his life is a lie, he was actually the illegitimate son of a monster, left out in the cold, adopted and then cheated. So he’s essentially this damaged soul, whose heartbreak hardens into a menace and a megalomania, a vanity, an arrogance and a pride, which I hope is why you can’t entirely hate him, because underneath all that villainy is a damaged soul. This entry was posted in action, Film News, Superhero Cinema, The Avengers and tagged Avengers Assemble, Joss Whedon, Loki, The Avengers, Tom Hiddleston. Bookmark the permalink.